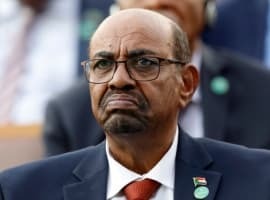 Khashoggi’s Revenge: Is Saudi Arabia Becoming A Pariah State? How Will Trump’s Stalemate With Kim Jong Un Impact Oil Prices? The way the world economy is manipulated by world leaders is a little like a giant video game. The object of the game is to keep the world economy growing, without too many adverse consequences to particular members of the world economy. We represent this need for growth of the world economy as being similar to making a jet airplane fly at ever-higher altitudes. Figure 1. Author’s view of the situation we are facing. World leaders look at their video screens and adjust their controllers to try to make the world economy fly at ever-higher levels. World leaders look at their video game screens for indications regarding where the world economy is now. They also want to see whether there are specific parts of the economy that are doing badly. There are numerous problems with this approach. For one thing, the video game screen doesn’t give a very complete picture of what is happening. For another, the aspects of the economy that can be controlled are rather limited. Furthermore, the situation is very complex–there seem to be several “sides” of the economy that need to “win” at the same time, for the economy to continue to grow: (a) oil importers and oil exporters, (b) businesses and their would-be customers, (c) governments and their would-be taxpayers, and (d) asset holders and the would-be buyers of these assets, such as families needing new homes. An even bigger problem is a physics problem that is hidden from the view of those operating the control mechanism. Jet airplanes in the real world cannot rise beyond a certain altitude (varying depending upon the plane), because the atmosphere becomes “too thin.” There is a parallel problem in the economic world. The atmosphere that allows an economy to grow is provided by a combination of (a) an increasing supply of cheap-to-produce energy, and (b) increased technology to put this growing energy supply to use. This atmosphere can become too thin for several reasons, including the higher cost of energy production, rising population, and growing wage disparity. Figure 2. 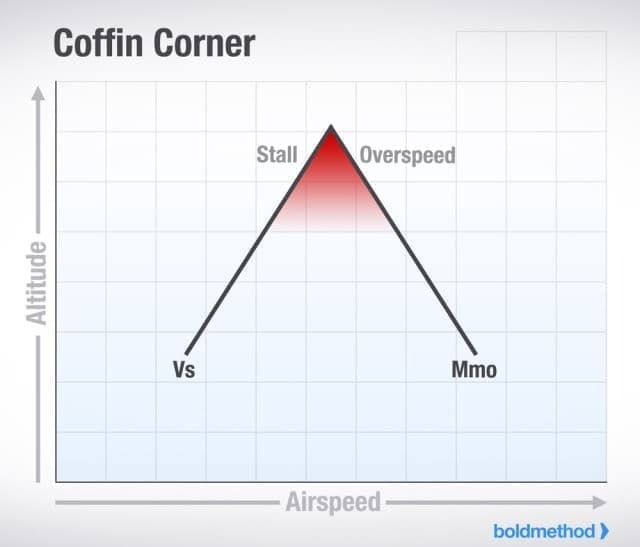 Diagram of Coffin Corner by Aleks Udris of Boldmethod. On the chart, Vs is the velocity; MMO is the Maximum Mach Number. What Happens As Coffin Corner Limits Are Reached in the Economic World? What do world leaders do, as the world economy hits limits? One temptation is for the world leaders in Figure 1 to take their foot off the throttle that is operated by low interest rates and more debt, because they don’t seem to be providing very much benefit anymore. The leaders fear that if more debt is added at low interest rates, it risks creating “asset bubbles” that are easily disturbed if any little bump to the economy occurs. If a big bubble pops, there is a significant risk that the economy could fall down to a much lower level. This is like stalling the jet at high altitude. World leaders can also use approaches that create situations more like “making the wings come off” the economy. These approaches involve favoring one group over another. For example, a government can give big tax breaks to businesses, but raise taxes on individual citizens. Businesses will ultimately be harmed by this approach, because they depend on individual citizens for their sales. The result is like tearing the wings off the airplane. Another approach that would tear the wings off the economy involves actions by a different group of world leaders than those shown in Figure 1, namely the leaders from OPEC and Russia. 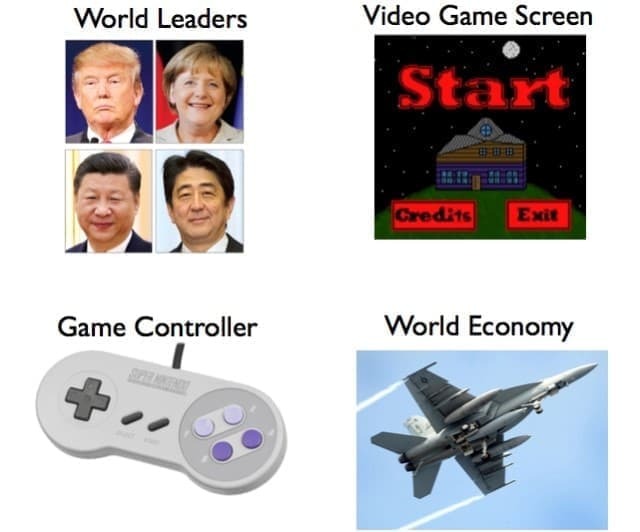 These leaders have different video game screens and different game controllers. They can manipulate the world economy by reducing the supply of oil they provide. 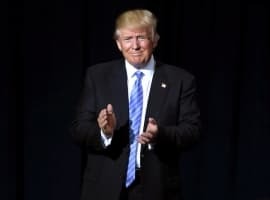 With this approach, they hope to increase the price of oil, and thus obtain a larger share of the world’s goods and services through higher tax revenue. Raising the oil price would benefit oil exporters, but would make goods and services more expensive for oil importing countries. Ultimately, this approach would lead to recession in oil importing nations. The result would likely be worse than the 2008-2009 recession–another way to make the wings come off the economy. Energy plays a huge role in this game, because a growing supply of cheap-to-produce energy allows greater worker productivity. It takes energy of various types to make the economy grow, because energy is needed whenever we move something, or heat something, or use electricity to operate something. We use energy products to leverage our human labor. For example, we use a truck to deliver a package, rather than walking and carrying the item in our hands. If fresh water is in short supply, we use energy to operate a desalination plant, and thus produce the fresh water we need. It is generally workers who produce goods and services. If energy supply is inexpensive and readily available, it is easy for governments or businesses to create “tools” to make these workers more productive. These tools include such things as roads, vehicles, machines of all types, and even computers. If the quantity and capability of these tools are increasing, the labor of these workers is increasingly leveraged by the availability of these tools. This is what allows economic growth. The extent of world economic growth seems to depend primarily on how quickly total energy consumption is growing. If we look at historical economic growth, we see that the rate of growth of energy consumption seems to play a major role. Figure 3. World GDP growth compared to world energy consumption growth for selected time periods since 1820. World real GDP trends for 1975 to present are based on USDA real GDP data in 2010$ for 1975 and subsequent. (Estimated by author for 2015.) GDP estimates for prior to 1975 are based on Maddison project updates as of 2013. 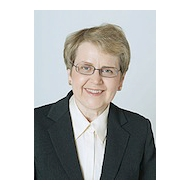 Growth in the use of energy products is based on a combination of data from Appendix A data from Vaclav Smil’s Energy Transitions: History, Requirements and Prospects together with BP Statistical Review of World Energy 2015 for 1965 and subsequent. The highest rates of world economic growth took place in the 1950-1965 period, and in the 1965-1975 period. These were both periods of very high growth in energy consumption. As we will see below, these were both periods when the price of oil was less than $20 per barrel, for almost the entire period. Figure 4. 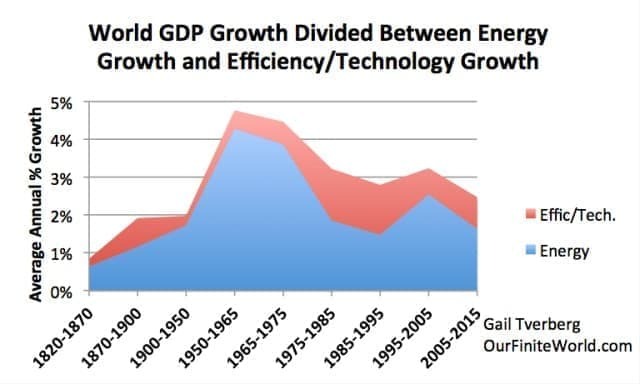 World growth in energy consumption vs. world GDP growth. Energy consumption from BP Statistical Review of World Energy, 2017. World GDP is GDP in U.S. 2010$, as compiled by World Bank. On Figure 4 (above), the widening gap between GDP growth and energy consumption since 2013 could either represent (a) Much greater efficiency in using energy or (b) A problem in measuring true economic growth. We can see true efficiency improvements in the 1975-1985 and the 1985-1995 periods shown on Figure 3. These were the periods when the world was truly trying to “get away from oil,” after a spike of high prices in the 1970s. Governments around the world were encouraging new smaller cars; electricity generation was being changed from oil to nuclear; home heating was being changed from oil to natural gas or electricity. The new furnaces installed were much more efficient than the old ones. Thus, during this period, efficiency/technology improvements were aiding economic growth to a greater extent than usual. Now, in the period since 2013, much of the “low hanging fruit” has already been picked. We may still be finding some technology gains, but it seems likely that at least part of the problem is an “economic growth counting problem.” GDP looks like it is growing, but it is really very hollow economic growth. Governments invest in projects of essentially no value, and their investment is counted as GDP. 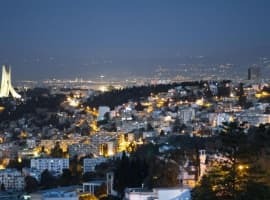 For example, they invest in unneeded roads, in apartments that citizens cannot really afford, in educational institutions that do not produce graduates with wages that are sufficiently high to pay for education’s high cost, and in high-priced medical cures that are unaffordable by 99 percent of the population. Are these things truly contributions to GDP? We also find businesses that look like they are growing, but in fact are taking on increasing amounts of debt as they sell off assets. This is not a sustainable model! We encounter energy companies that claim to be doing “sort of” alright, but their profits are so low that they need to cut back on new investment, and they need to borrow in order to have funds to pay dividends to shareholders. There is something seriously wrong with this growth! The economic “atmosphere” becomes thinner and thinner, when oil prices rise above an inflation-adjusted price of $20 per barrel. 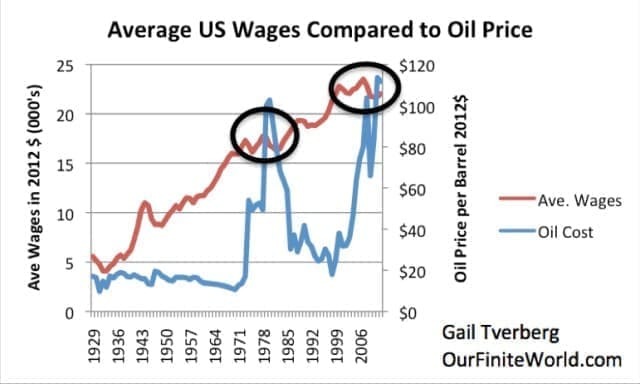 Back in the time period prior to 1973, oil prices were generally below $20 per barrel, in inflation adjusted terms. Since then, prices have tended to be above this level. Figure 5. Historical oil prices are Brent oil prices in 2016$ from BP Statistical Review of World Energy 2017; $20 per barrel is the maximum price level where oil is truly affordable; and $300 per barrel is the maximum price per barrel that the International Energy Agency seems to believe is possible for the world economy. When oil (and other energy prices) were very low, companies could add tools to make workers more effective with little expenditure. As a result, the United States saw wages growing much more rapidly than inflation prior to 1968 (Figure 6). Figure 6. 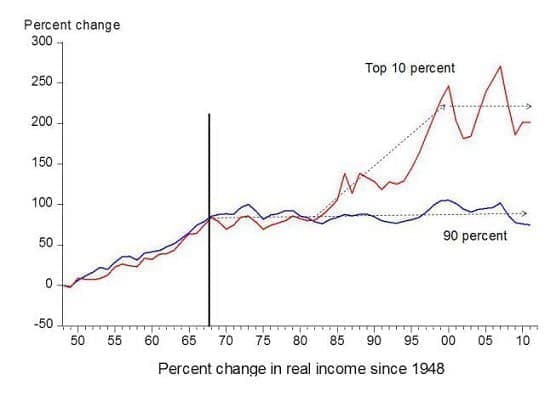 Chart comparing income gains by the top 10 percent to income gains by the bottom 90 percent by economist Emmanuel Saez. Based on an analysis IRS data, published in Forbes. Once prices of oil started rising, prices of tools (broadly defined) rose. Governments and companies needed more debt to buy these tools. It became more of a burden to add capital goods of all kinds. Governments tried to raise GDP by adding debt, but to a significant extent they ended up with higher debt to GDP ratios rather than the rapid growth they were looking for (Figure 7). Figure 7. Worldwide average inflation-adjusted annual growth rates in debt and GDP, for selected time periods. See post on debt for explanation of methodology. The changes in the economy that allowed continued growth (more debt and more technology) tended to push the economy toward more wage disparity, in part because more technology required more training for some of the workers, but not for others. This allowed wages of the workers with special training to rise. Furthermore, the need to repay debt with interest tended to funnel wealth toward the financial sector, and toward those within the economy who could afford to hold financial assets. These changes left less of the output of the economy for non-elite workers. It makes goods of many kinds more expensive. It reduces job availability and wages. Figure 8. Average wages in 2012$ compared to Brent oil price, also in 2012$. Average wages are total wages based on BEA data adjusted by the CPI-Urban, divided total population. Thus, they reflect changes in the proportion of population employed as well as wage levels. Logic would suggest that the economy cannot really operate on high-priced oil. Lower wages and higher prices do not peacefully coexist! We should expect high oil prices to be very unstable. Even if prices can reach a high level in response to a specific shortage or stimulus, we cannot expect these high prices to be maintained for a sustained period, without added stimulus. Unstable high prices are not likely to give rise to more oil production; they cannot be depended upon. It never occurred to organizations such as the International Energy Association (IEA) that high oil prices might be a problem for the economy. The IEA has shown exhibits suggesting that oil prices could theoretically rise to $300 per barrel. Of course, at such an elevated price, there would be an almost unlimited amount of oil available to extract (Exhibit 9). Figure 9. 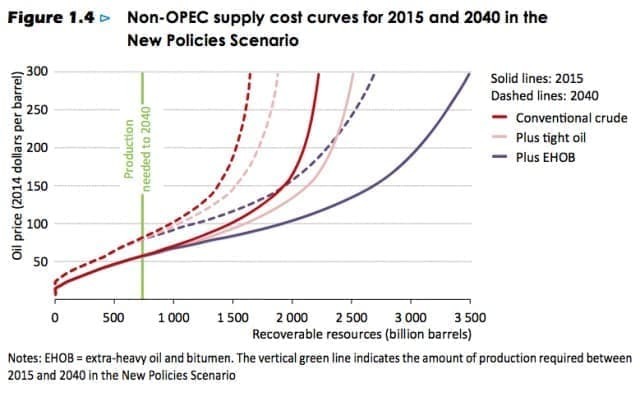 IEA Figure 1.4 from its World Energy Outlook 2015, showing how much oil can be produced at various price levels. The real enemies of continued economic growth are (a) diminishing returns with respect to oil and other energy production, (b) continued population growth, and (c) increasing wage and wealth disparity. We seem to be playing a video game where the players don’t understand who the real enemies are. Diminishing returns with respect to oil and other energy production have to do with the cost of energy extraction rising ever-higher, as more resources are extracted. There are a lot of resources that we can “see,” but that we cannot economically extract, unless prices rise to very high levels. Figure 10. 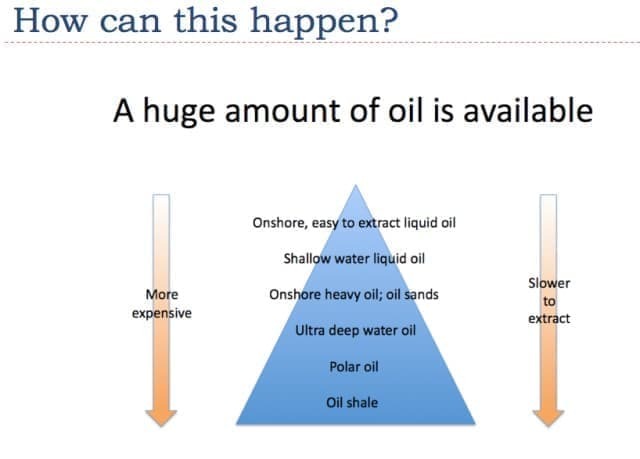 My version of the resource triangle for oil. Note that oil shale is not the same as tight oil, found in shale formations. Oil shale is kerogen that must be processed at very high temperatures in order to produce oil. This is rarely done, because of the high processing cost. Tight oil is not on this chart. Tight oil probably would be above “onshore heavy oil; oil sands.” It still would disappear, if oil prices permanently fell to $20 per barrel or less. Continued population growth is a problem because it is really “energy per capita” that matters. Each individual needs food, transportation, and housing. All of these things take energy. Many years ago, when most of the workers were farmers, it was necessary to create ever-smaller farms, as population rose. This clearly would lead to lower food production per farmer, unless some sort of technological breakthrough was taking place at the same time. Today, we have a parallel issue. Increasing wage disparity tends to be associated with the rising use of technology. When most labor is hand labor, workers truly do “pay each other’s wages.” All wages can be fairly equal. With increased technology, some workers have specialized training; others do not. Some workers are supervisors; others are laborers. Unless the overall output of the economy is rising very rapidly, non-elite workers find themselves increasingly unable to afford the output of the economy. It is this falling “demand” (really affordability) that tends to pull an economy downward. High oil prices can be temporarily tolerated by an economy, if interest rates are lowered to make this arrangement work. Clearly, lower interest rates make capital goods of all kinds more affordable to both businesses and individual workers. If we look back at the period since 1981, we see a long period of falling interest rates, acting to stimulate the economy. When oil prices exceeded $20 per barrel, the economy did not collapse immediately. In “normal” times, lowering interest rates was sufficient stimulus to keep the economy growing (Figure 4). Figure 11. Ten-year treasuries through Nov. 17, 2017. Chart produced by FRED. 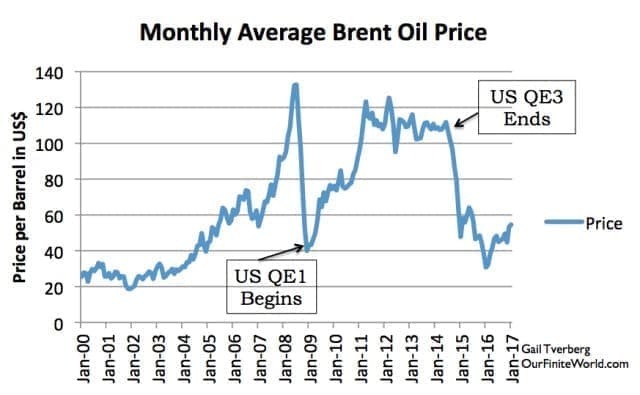 When there is a very big drop in oil prices (as in 2008, related to falling debt levels), then Quantitative Easing (QE) has been helpful (Figure 11). The U.S. began its program of QE in late 2008, when oil prices were near their low point. There were three phases of the U.S.’s QE. The U.S. discontinued the third phase in late 2014, just as oil prices started to slide again. Figure 12. Monthly Brent oil prices with dates of U.S. beginning and ending QE. 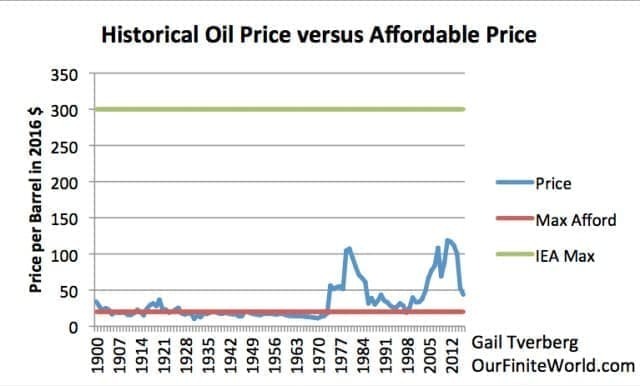 It is quite possible for a disconnect to occur between (a) the cost of oil extraction, and (b) the selling price of oil. Oil that costs more than $20 per barrel is never very affordable by the economy. It really needs continual stimulus to keep prices at an elevated level. Once debt growth falls too low, the balance between the supply and demand for oil is settled in the direction of the amount of goods and services made with oil that non-elite workers can afford. Prices fall below the cost of production. This seems to be what has happened since 2014. In fact, since 2014, the selling prices of oil, natural gas, and coal have all fallen below the cost of extraction. Figure 13. Price per ton of oil equivalent, based on comparative prices for oil, natural gas, and coal given in BP Statistical Review of World Energy. Not inflation adjusted. It is popular to think that the reason why oil prices are too low is because of overproduction by the United States or Saudi Arabia. 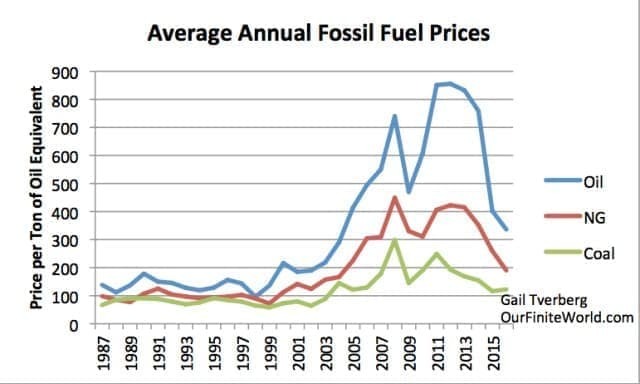 When a person stops to realize that essentially the same situation arises for all three fossil fuels, a person begins to understand that there likely is an affordability issue underlying the low prices for all three fuels. The affordability issue, of course, arises because energy supply is not rising quickly enough because (at over $20 per barrel), it is too expensive to be truly affordable. The “atmosphere is too thin” at today’s high cost of energy extraction. Coal production seems to have “peaked” because at today’s low prices, few mines find the extraction of coal profitable. It is popular in “Peak Oil” circles to believe as the economists do: oil and other energy prices can rise endlessly, because of growing “demand.” Economists have never stopped to think that at any given price, there is an affordability issue for customers. If prices drop too low, there is a profitability issue for those operating extraction facilities. If we look at the situation with coal, we see a situation where peak production seems to have been reached because of low prices. China has closed down mines because falling prices have made mines that were previously profitable, unprofitable (Figure 13). Coal is the lowest-cost fuel; if it cannot be mined profitably, the world economy has a problem. Figure 14. 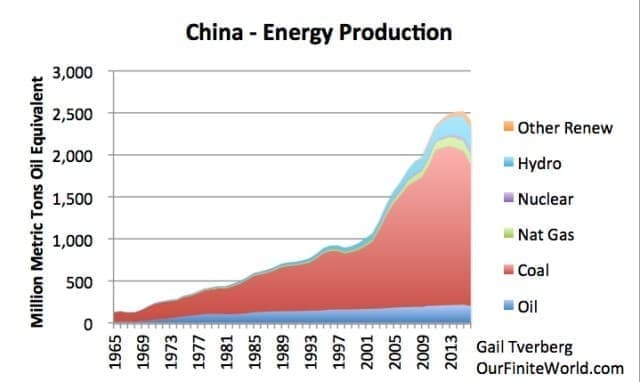 China’s energy production, based on data from BP Statistical Review of World Energy, 2017. In fact, it appears as though we have reached peak coal on a worldwide basis, as a result of low prices (Figure 14). It is hard to see any major production area that can grow substantially in the future, without much higher prices. Figure 15. 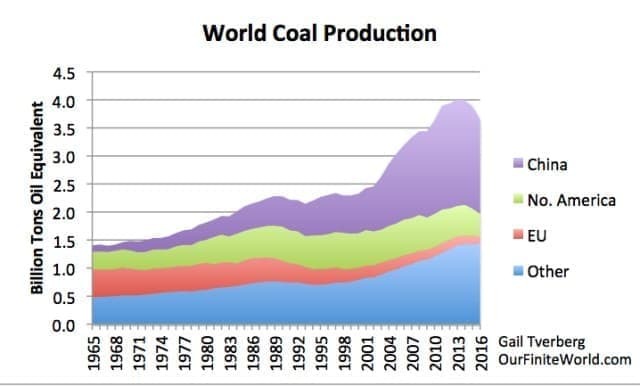 World coal production, based on BP Statistical Review of World Energy Data. (For 1965-1980, consumption is substituted for production, because only consumption is given, and imports/exports are likely small. The world economy needs to be able to keep repaying debt with interest. If world economic growth slows too much, this will not be possible. Figure 16 suggests that affordability and price go together. 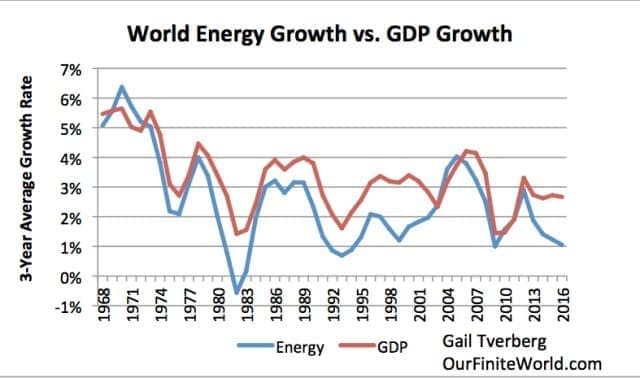 When the world economy is growing rapidly, energy prices tend to rise (as does energy consumption). 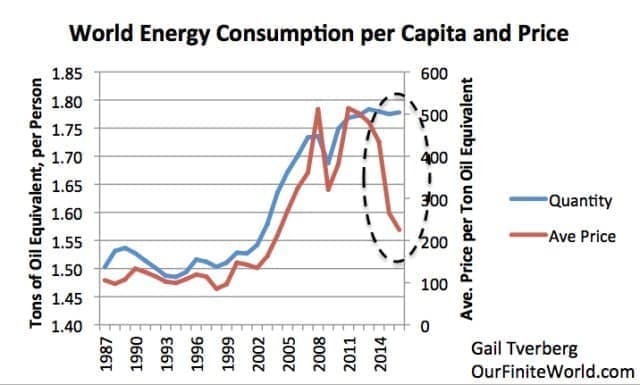 When energy consumption per capita falls, it is a sign that the world economy is not doing well. One of the things that confuses matters is the very different economic growth results for different parts of the world. If oil prices are low, this improves economic growth prospects from the point of oil importers, such as the United States and China. This is what our video game players are looking at, not the results for the world as a whole. It is oil exporters, such as Venezuela and Saudi Arabia, who are having problems. If we look at world news, Venezuela may collapse because of low oil prices. Saudi Arabia has found it necessary to take on debt, and has undergone regime change, at least partly related to low oil prices. Norway is proposing that its oil and gas fund no longer invest in oil and gas companies, because it expects that there is a significant chance the oil price will not rise high enough to bring companies back to adequate profitability. The whole “game” has been confused by a lot of not-quite-correct pronouncements from academic circles. A lot of well-meaning people have tried to solve our energy problems, but haven’t gotten the story right. Economists have gotten the story pretty much 100 percent wrong. Energy is very important for the economy. Furthermore, energy prices don’t rise endlessly. Peak Oilers have confused matters by talking about oil, coal and natural gas being determined by the amount of technically recoverable resources in the ground. This might be true if energy prices could rise endlessly, but clearly, they cannot. By following the wrong views of economists, Peak Oilers have led world leaders to believe that far more resources are available to be extracted than really is the case. People who call themselves Biophysical Economists haven’t really gotten the story correct either. The Biophysical Economists realized that there was a need for a measure for diminishing returns. They put together a measure which they called Energy Returned on Energy Invested. The measure, unfortunately, only “sort of” works. It gives a lot of wrong answers. It does not suggest that oil prices above $20 per barrel are a problem. It also does not suggest that substitutes for oil that are priced above $20 per barrel are a problem. It tends to give a lot of “false positives” when it comes to the question of whether renewables can be substituted for fossil fuels. It seems to suggest that a particular ratio is important, when it is really the total quantity of an energy product available at a very low price that is important. I should not pick on the Biophysical Economists. There are many others with academic credentials who produce metrics that really aren’t very helpful. Energy payback time is not a very helpful metric, especially from the point of view of deciding whether or not to use a particular device. It is not the energy that the economy must pay back; it is the full cost of manufacturing the device that needs to be recovered, including human labor costs and taxes. In some applications, the cost of mitigating intermittency may also need to be considered. Even the standard Levelized Cost of Energy calculations can give misleading indications, if they are used on intermittent renewables without taking into account the cost of mitigating the intermittency. With all of these issues, it is not surprising that world leaders have difficulty playing the energy and economy game. In fact, it is hard to see any winning strategy. One of the issues that makes the game impossible to win is the fact that all sides must win. A solution that cuts out the oil exporters is a problem for an economy dependent on oil. Any solution that cuts out the workers is a problem, partly because businesses need workers as consumers, and partly because governments need workers as taxpayers. The reason I have not included any discussion of renewables is because at this point in time, we do not have any renewables that are sufficiently inexpensive and sufficiently scalable to represent a solution.